Eight persons A, B, C, D, E, F, G and H are living on eight different floors of the building in such a way that the ground floor is numbered one, the one above floor is numbered two and so on till the topmost floor is numbered eight. They all are like different colours namely, Purple,Magenta, Blue, Grey, Green, Red, Yellow and White but not necessary in the same order. 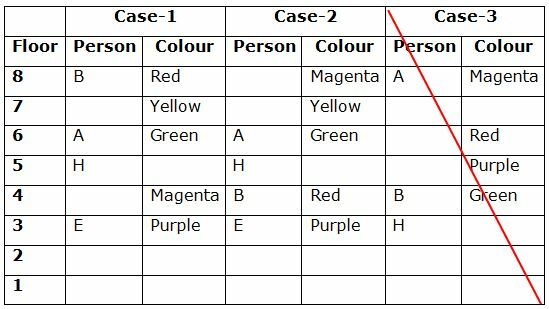 Three persons are living between B and the one who likes Magenta.Only one person lives between A and the one who likes Red.There are two persons live between the one who likes Purple and A, who lives on one of the even numbered floors above fourth floor. Either the one who likes Magenta or B lives on the topmost floor. H lives on the floor immediately below the one who likes Green and does not live on the ground floor. H does not like Magenta and Red. The one who likes Green does not live on odd numbered floor. Three persons live between E and the one who likes Yellow. E lives one of the floors below the one who likes Yellow. 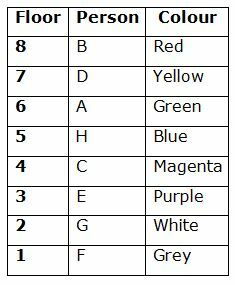 F lives below E. As many persons sitting between B and the one who likes Blue is same as between the one who likes Blue and G. G does not like Grey. D does not like Magenta. 1. H likes which of the following colours? There are two persons live between the one who likes Purple and A, who lives on one of the even numbered floors above fourth floor. Only one person lives between A and the one who likes Red. 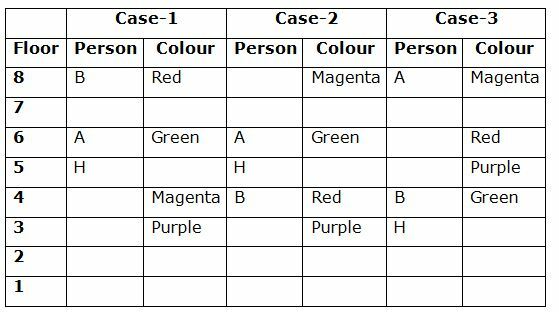 Three persons are living between B and the one who likes Magenta. Either the one who likes Magenta or B lives on the topmost floor. H lives on the floor immediately below the one who likes Green and does not live on the ground floor. H does not like Magenta and Red. The one who likes Green does not live on odd numbered floor. Three persons live between E and the one who likes Yellow. E lives one of the floors below the one who likes Yellow. 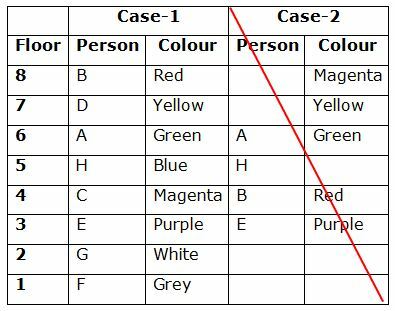 F lives below E.
As many persons sitting between B and the one who likes Blue is same as between the one who likes Blue and G.
G does not like Grey. D does not like Magenta. 2. How many persons are living between G and the one who likes Green? 4. Which of the following colours is liked by the person who lives immediately above H? 5. If G is related to Yellow and A is related to Purple in a certain way. Then, B is related to which of the following? 6. If all the odd digits in the number ‘72651348’ are added by ‘2’ and all the even digits are subtracted by ‘1’, then how many numbers will be repeated? 7. In a class of 35 students, Renu is 23rd from the top and Raju is 18th from the bottom. Then , how many students are there in between Renu and Raju? Renu is 23rd from the top and Raju is 18th from the top. So, there are four persons are in between them. 8. If all the digits in ‘54327618’ are arranged in ascending order from left to right, then the position of how many digits will remain unchanged? The positions of first and fifth letters of the word ‘SEMANTIC’ are interchanged. Similarly, the position of second and sixth and so on till the fourth and eight letters are interchanged. In the new arrangement thus formed, how many letters are there in between the letter which is third form the right and third from the left in the English alphabetical order? E~I = F, G, H.
10. E, F, G, H and I are five friends are in different heights. G is taller than E and I and shorter than only F. I is taller than only one person. Who is the shortest? 1) H likes which of the following colours? 2) How many persons are living between G and the one who likes Green? 4) Which of the following colours is liked by the person who lives immediately above H? 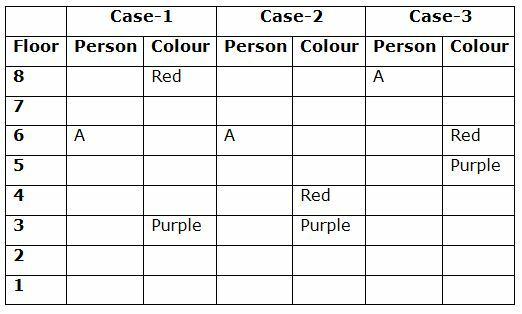 5) If G is related to Yellow and A is related to Purple in a certain way. Then, B is related to which of the following? 6) If all the odd digits in the number ‘72651348’ are added by ‘2’ and all the even digits are subtracted by ‘1’, then how many numbers will be repeated? 7) In a class of 35 students, Renu is 23rd from the top and Raju is 18th from the bottom. Then , how many students are there in between Renu and Raju? 8) If all the digits in ‘54327618’ are arranged in ascending order from left to right, then the position of how many digits will remain unchanged? 9) The positions of first and fifth letters of the word ‘SEMANTIC’ are interchanged. Similarly, the position of second and sixth and so on till the fourth and eight letters are interchanged. In the new arrangement thus formed, how many letters are there in between the letter which is third form the right and third from the left in the English alphabetical order? 10) E, F, G, H and I are five friends are in different heights. G is taller than E and I and shorter than only F. I is taller than only one person. Who is the shortest?